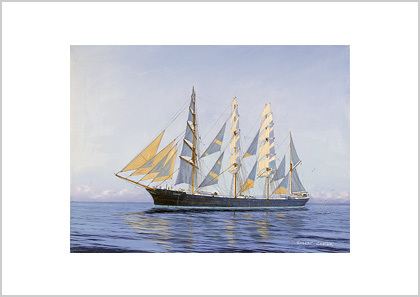 Sailing ship prints from the golden age of sail. 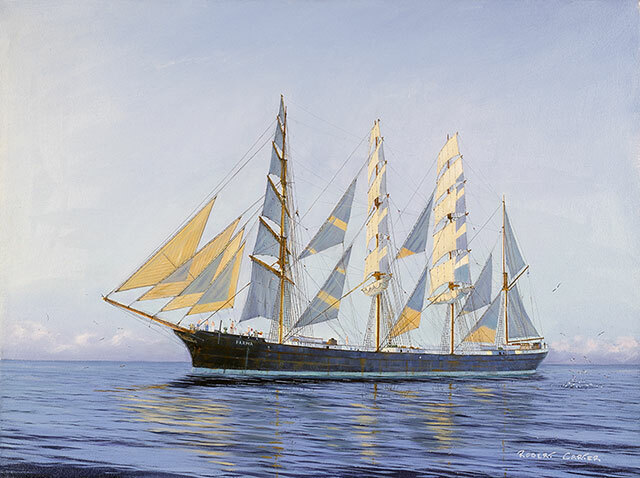 The 4-masted barque Parma, lying becalmed; a situation familiar to all those who travelled in ships with sails. Calms were encountered at various times during a round the world voyage and their significance has always been stressed by my story tellers. The most protracted period of calm occurred in the equatorial belt known as the Doldrums, and it was not uncommon for ships to be becalmed for three or four weeks, sometimes more. This region caused the crew and officers frustration and strangely created as much work as heavy weather. The slightest hint of wind required the yards to be trimmed, even though this catspaw might only last for a few minutes, or drop off, and then come from another direction. If this happened, the yards would have to be trimmed again, in an effort to gain a few hundred metres in the right direction. The courses were usually clewed up when there was no wind to prevent them from slatting about and becoming chafed. The upper sails, being sheeted to a yard, did not suffer in this way. Sometimes in spite of no wind, there would be a swell caused by a storm perhaps thousands of miles away. This caused the ship to roll monotonously from one side to the other, making life difficult. There are instances where this rolling caused ships to be dismasted. The old superstition of whistling for a wind, whether it was believed or not, was often practised by Master and Mates. Many seamen have told me of the ‘old man’ walking around the poop whistling quietly and casting glances towards the glassy sea, in the hope of seeing the surface ruffled by the wind that might be the beginning of the North or South East Trades. This superstition often carried further, as in heavy weather anyone whistling within earshot of the poop was told to ‘pipe down’ for fear of increasing the wind strength even more. Those in the watch below could fish or swim, although the latter was not without risk. The watch on deck carried out normal work when not hauling yards around, and it was an ideal time for painting or chipping rust over the side. Other parts of the world produced calms, but not as predictable as the Doldrums and often harbingers of a storm. I have heard of calms off Cape Horn, even in mid-winter and it is certain that there would be no whistling in this case. Fine quality giclée print on Chromajet Spectrum 225 gsm satin paper. Although the inks used for these giclée prints is guaranteed to last 90 years under normal circumstances, their life will be reduced if hung in direct sunlight or strong ultraviolet light. They are intended to be framed under UV inhibiting glass, using acid free mounting materials. Non-reflecting glass is also recommended. Shipping locations: We ship to Australia, New Zealand, Europe and the USA for orders via the shopping cart. For other destinations please contact us for a shipping quote. The four-masted barque Parma, lying becalmed; a situation familiar to all those who travelled in ships with sails. Fine quality giclée print using lightfast ink on Canson ‘Aquarelle Rag’ 240 gsm art paper.